Former US president Barack Obama is tipped to be planning to visit New Zealand within weeks – and his visit is closely linked with Air New Zealand. It’s not suggested that Obama is being hired to help run the airline – although, hey, wouldn’t that be a story! Obama has said repeatedly that he wants to visit New Zealand and Air NZ is reported to have extended an invitation. A visit by Obama, now a private US citizen, could be perfectly timed for Air NZ. The New Zealand carrier is expected to launch a new route to Chicago soon, probably using one of its B787-9 Dreamliners, an aircraft type for which it was launch customer. The cost of any such visit has been called into question, however, by Winston Peters, New Zealand’s Deputy Prime Minister and Minister of State Owned Enterprises. Peters, one of New Zealand’s best-known, most senior and shrewdest politicians, suggests the amount Air NZ would have to pay to secure an Obama visit and speech would be more than he [Peters] was happy with as a shareholding minister of Air NZ. The NZ government is the majority shareholder of Air NZ and Peters is keen to know the terms on which Obama would be coming. According to the New Zealand Herald, Peters says he knows what Obama’s going rate is for delivering speeches, “and I know we can’t afford it”. 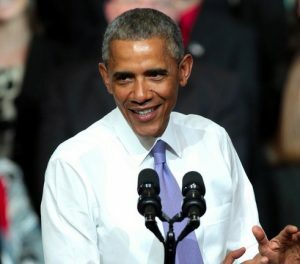 Obama is reported to have been receiving fees USD 400,000 for speeches in the US.